Simply Centers: Writing Prompts That'll Make Them Think! Writing Prompts That'll Make Them Think! I'm not sure how you do your centers, but I ALWAYS have a Writing Center each week. I usually give students a writing prompt that gets them thinking and challenges them in their creativity or thinking skills. If you're like me, though, by the time I plan at the end of the day, end of the week, or weekend my brain can be pretty friend and it may take a while to think of something good. That's why I've created this pack of 50 Writing Prompts that are fun and creative to get your kids thinking. No more pushing through the Writing Prompt block . . . all I have to do now is print enough copies for each of my students and Writing Center is good to go! The way my Writing Center runs, my students just cut off one of the prompts that I've printed out (10 of the same prompt on one page), glue it into the Writing Journal, and write away! It's as simple of that (and you don't have to make 23 or however-many-students-you-have copies)! 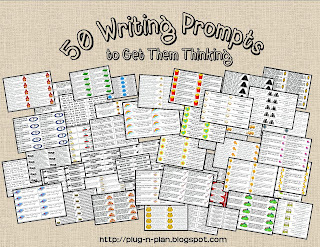 Click the preview below to grab your copy of my 50 Writing Prompts to Get Them Thinking! *Click here to get it from Teachers Notebooks.